And is replanted in the land of Eden. I shall now recall Maron,1 for he too adorned the godly choir of the saints. Embracing the open-air life, he repaired to a hill-top formerly honored by the impious. Consecrating to God the precinct of demons on it, he lived there, pitching a small tent which he seldom used. He practiced not only the usual labors, but devised others as well, heaping up the wealth of philosophy. The Umpire measured out grace according to his labors: so the munificent one gave in abundance the gift of healing, with the result that his fame circulated everywhere, attracted everyone from every side and taught by experience the truth of the report. One could see fevers quenched by the dew of his blessing, shivering quieted, demons put to flight, and varied diseases of every kind cured by a single remedy; the progeny of physicians apply to each disease the appropriate remedy, but the prayer of the saint is a common antidote for every distress. He cured not only infirmities of the body, but applied suitable treatment to souls as well, healing this man's greed and that man's anger, to this man supplying teaching in self-control and to that providing lessons in justice, correcting this man's intemperance and shaking up another man's sloth. Applying this mode of cultivation, he produced many plants of philosophy, and it was he who planted for God the garden that now flourishes in the region of Cyrus. A product of his planting was the great James, to whom one could reasonably apply the prophetic utterance, "the righteous man will flower as the palm tree, and be multiplied like the cedar of Lebanon," and also all the others whom, with God's help, I shall recall individually. Attending in this way to the divine cultivation and treating souls and bodies alike, he himself underwent a short illness, so that we might learn the weakness of nature and the manliness of resolution, and departed from life. A bitter war over his body arose between his neighbors. One of the adjacent villages that was well-populated came out in mass, drove off the others and seized this thrice desired treasure; building a great shrine, they reap benefit therefrom even to this day, honoring this victor with a public festival. We ourselves reap his blessing even at a distance; for sufficient for us instead of his tomb is his memory. 1. Maron, while professing himself the disciple of Zebinas, emerges from the Rel. Hist. 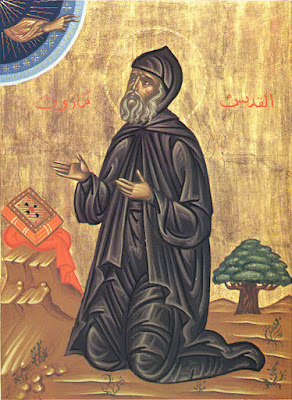 as the first influential hermit of the region of Cyrus (Cyrrhus). His pattern of life in the open air, exposed to the extremes of the climate, was imitated by many: James, Limnaeus, and others - and gave the asceticism of Cyrrhestica a distinctive character, for elsewhere hermits normally lived in cells or caves. Since his disciple James entered in his labors in 402, Maron must still have been alive then; but he must have died before Theodoret came to Cyrrhus in 423, since it appears that they never met. It is surprising, in view of Maron's importance, that this chapter is so brief and sketchy. A partial explanation is provided by the fact that Maron's fame was eclipsed by that of his disciple James. He may be the 'Maron priest and monk' who received a letter from John Chrysostom (ep. 36) between 404 and 407, but he is not to be identified with Maron of Apamea. From History of the Monks of Syria.